James H. Forrester, CPA, CFP the founder of the firm, is a graduate with Special Distinction from Arkansas State University where he attended on a tennis scholarship. Jim's focus has been on individuals and small businesses. Jim has extensive knowledge in taxation, choice of an entity, real estate transactions and 1031 exchanges. Jim is proud of the firm's reputation in the community. Eric M. Belisle is a graduate of Troy State University with a Bachelor of Science degree in Business Administration along with a Master's of Business Administration. He has been with the firm since 1999. Eric has extensive experience in individual and business taxation. He has also been certified as an expert in the Lee county circuit court system and provides services as an expert witness. Craig Whitaker is a graduate of Florida Gulf Coast University with a Bachelor of Science degree in Accounting along with a Master's of Science degree in Accounting & Taxation. He has been with the firm since 1999 and has extensive experience in business consulting and taxation. Craig's industry expertise includes real estate taxation, construction reviews, medical, law firms and many other businesses. He is also well informed on business startup procedures and accounting software organization. Craig also holds a captain's license and enjoys charter fishing in his free time. 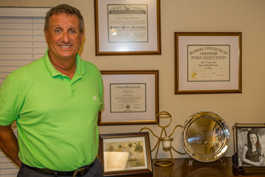 Jerry Moore, Jr is a graduate of Florida Gulf Coast University with a Bachelor of Science degree in Accounting along with a Master’s of Science degree in Accounting and Taxation. He has been with the firm since 2004. Jerry has extensive experience in individual, business and non-profit taxation. He is also well informed on technology and its implementation for your accounting and business needs.